I decided to welcome the new year with this luscious strawberry cream shortcake. The cake was done and the scene was set for my perfect shot of the cake. And just as I disappeared into my study to bring in a lens, I came back in time to see my little mischief monger at work! Deeply scrutinizing and slaughtering my perfect slice with the fork and spoon as if it were play dough. And out went my plans for that “dreamy” shoot as half the cake was devoured by the adults no sooner than it was done. I managed to take the main shot just before the entire cake was relished and eaten up! “You deserve a prize for this” declared Ro, after he had eaten a few spoons and complimented me further by saying that it was one of the best things he has eaten. And my dear husband, if you are reading this, do take note that I’m still waiting for that prize! Ever since I had seen Kurma’s shortcake, I had been wanting to make it and with strawberries in season here, I thought that this would be the best thing to bring in the new year. I even made a batch of fresh strawberry jam as I had none on hand but with plenty of strawberries lying in the refrigerator, I had nothing to fear! This strawberry shortcake is elegant, full of flavour and beautiful colour and something that instantly appeals to the heart. It is so easy to make a strawberry creation look striking because of their natural ruby red colour. You can go all out to decorate this cake for a special occasion or leave it simple like I have for a simple family affair, making it look a bit rustic yet charming at the same time! Cake, jam and cream always make for a super delicious treat and with all of this going in together here and topped with fresh seasonal strawberries, what more can one ask for? Make this and revel in the contentment of the happiness of your loved ones. The base used here is not as soft as a sponge cake but not as hard as a tart, but something in between if you know what I mean. When strawberries are not in season you can use other seasonal produce like peaches, mangoes or other ripe berries. Since I didnt have full fat cream on hand, I had to use low fat and blend it with a few other ingredients to get the required thickness. If you have access to good full fat cream, you might want to use that too. Lightly butter the base and the sides of a fluted 9” pie tin. Alternatively use a cake pan. Pulse the walnuts in a food processor and make sure that it does not get pasty. In a bowl mix the flour, baking powder and baking soda and sieve once. Mix in the powdered walnuts with a whisk. Put in the melted butter and mix with your hands until the mixture starts to resemble breadcrumbs. In another bowl put in the yogurt and whip until smooth and mix in the sugar and stir until the sugar dissolves. Put in the extract and mix well. Pour the yogurt into the flour mixture and mix until smooth. Add the additional water if the batter is very stiff. The batter is not supposed to be stiff and also not of pouring consistency. Put the batter into the in and bake for 35 to 40 minutes or until done. For the cream topping, combine all the ingredients in a chilled bowl and beat until you get soft peaks. You can also beat cream into stiff peaks and pipe it over the cake. Place the cake on a serving platter and spread the jam over it. Pour the cream in the centre and tilt the plate for the cream to spread evenly all over. 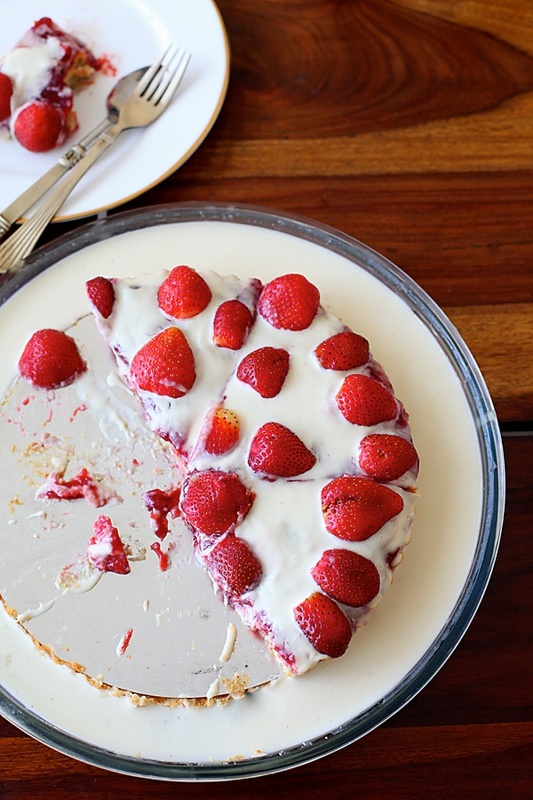 Decorate with fresh strawberries and serve. My homemade yogurt was not thick so I didnt have to use much water. You might want to place the cream in the refrigerator to thicken it a bit. Loosely adapted from Kurma Das's recipe. I am going to hold on to my strawberries till I bake this shortcake. Absolutely stunning..nom..nom. This is really elegant..wow love it. 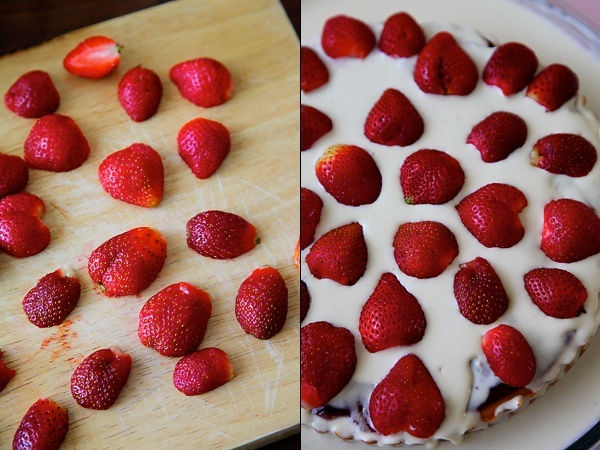 I must buy strawberries to make this gorgeous cake. Wonderful! Absolutely stunning! :)) Keep up the wonderful work! Super stunning shortcake,feel like having some rite now. OMG. this looks amazing. YUM!!!! really gotta try…. i am drooling…. This cake looks gorgeous!! 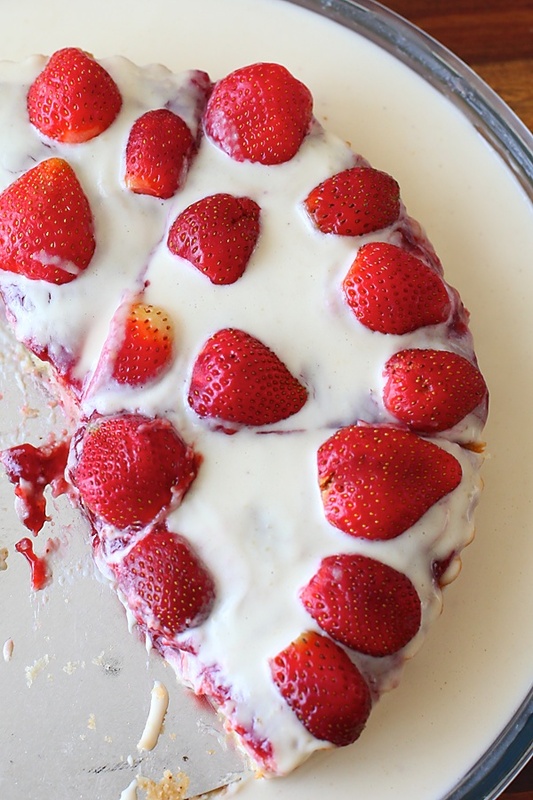 I am sure my husband and daughter (both love strawberries) will love me a little more if i bake this 🙂 Will definitely make it this strawberry season! 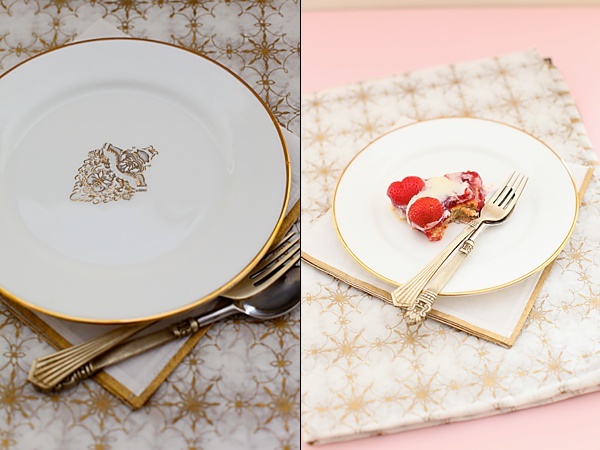 Love that tableware- It's SO elegant! Ofcourse, bow downs to the strawberry shortcake. This recipe is so very good can't wait to prepare it. Could you please enlighten me regarding the consistency of the batter … does it need to be like cake batter just about dropping consistency ?? Poornima: That's such a sweet thought! Hope your weekend treat turns out to be fabulous! Simi: Those napkins are your gift to me. Thanks! 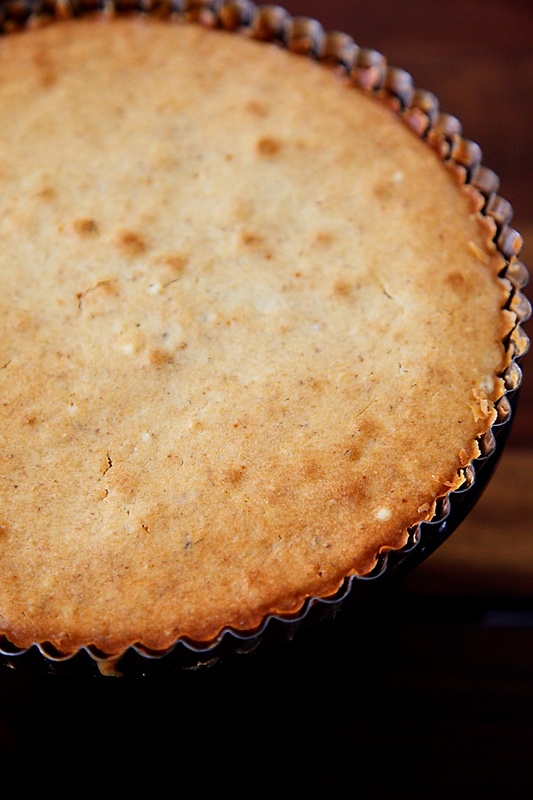 Arundati: You have hit the nail on the head…cake batter just about dropping consistency! Wonderful! I've been looking for an egg less recipe for my bog and my bestie whos a vegetarian! Thank you so much..it looks beautiful! Hi Anushruti, just landed onto your website. I am having some difficulty finding the previous posts. How do I do that (apart from going through the recipe index ofcourse)? Pratiksha:So glad to be of help! Hope you tried this and liked it. Juhi: Is there a particular reason you want to browse through posts chronologically? When we redesigned divinetaste we gave it a magazine layout and got away with archives. Let me know if this is really important to you. Priya: I use a Siemens built in oven but have got equally good results with my bajaj OTG. Morphy Richards has a good oven. Go in for their largest capacity. Hi,I have been recently following you.you are really doing a good job.Glad that I found your blog. The reason i am wtiting this mail is i want to know the exact measurement for one egg equals to how much of butter milk in case to convert the egg base cakes.Is there any other alternate for EGG other than buttermilk. 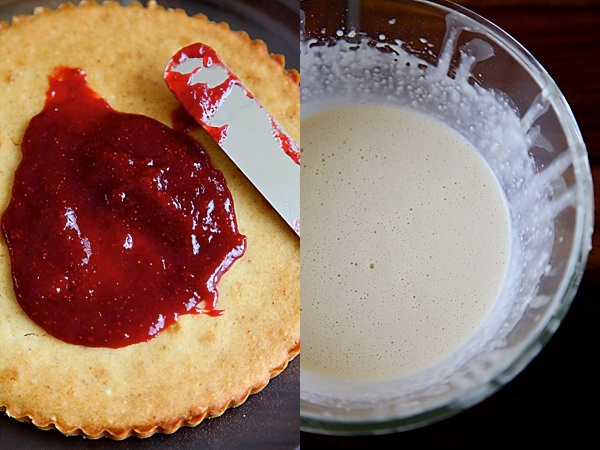 bhuvana: 1/4 cup buttermilk would substitute one egg. There are many alternatives like yogurt, flax seed, condensed milk etc. hi Anu.. made this cake last week and thank you so much for this wonderful recipe…have been waiting all these days to get hold of some straw berries and finally got them last week..with a small portion i made the strawberry jam with your recipe and it was yummy…the cake was so delicious..flavourful..my boys loved it..thank you Anu..waiting for more recipes from you..
Anuradha: IT's great that you and your boys loved it! Making your children happy through your cooking is one of the most rewarding attribute of life as a mother. Thanks a lot again for the advise..
Can we use powdered almonds instead of walnuts and regular nestle curd available in market…. Radhika: I'm so happy to get your feedback on this. hi anushruti i made this strawberrry shortcake and it was beyond delicious!thank you so much for these recipes!btw can u also post an eggless lemon tart? sam: Sure. Eggless lemon tart seems to be a popular request here. Anushruti, thanks a ton for a keeper of a recipe!! I made this one this evening and it was a super hit with my entire family. So very succulent and flavourful.